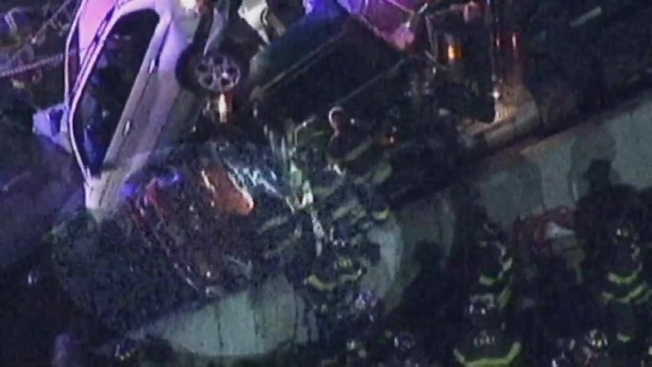 Firefighters were able to extricate a man from a car mangled beyond recognition in a six-car pileup on the Gowanus Expressway Thursday morning, dramatic Chopper 4 footage shows. Firefighters were called to the wreck near 66th Street in Brooklyn's Bay Ridge, which involved the four vehicles and blocked the highway's westbound lanes, at about 6:15 a.m., authorities said. Chopper 4 footage from the scene shows a flatbed truck, a silver SUV, a second hauling truck and a badly crumpled red Toyota. The SUV is piled atop the Toyota, which is also pinned between the two trucks and is so badly damaged it is beyond recognition. Two other vehicles were involved. “When I looked at this mangled car, I just shook my head and I said I can’t believe that this guy is alive and speaking,” said FDNY Battalion Chief Mark Ford said. Firefighters were able to extricate an apparently uninjured man from a car badly damaged in a four-car pileup on the Gowanus Expressway Thursday morning, dramatic Chopper 4 footage shows. 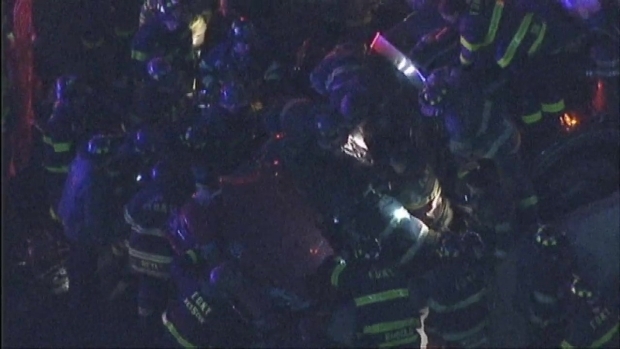 Chopper 4 footage shows dozens of firefighters crowding around the grisly scene. They can be seen extricating the man in the badly damaged Toyota. "Normally, when you see cars like this, they're usually fatalities," said FDNY Lt. Pat Mitchell, one of the firefighters who responded to the scene. Dramatic footage shows the man appear to stand up with the help of firefighters, who run over with a stretcher. As he is being strapped to the board, he can be seen moving his arms and legs and appears to have escaped serious injury. Firefighters said at a news conference that they had to work quickly to free the man because of the threat posed by the SUV suspended over the car. They cut the top of the crushed vehicle using hydraulic rescue tools and found the man sitting in a small 9-square-foot space that wasn't as heavily damaged as the rest of the vehicle. The man told police he couldn't feel his legs, but once he was pulled out of the space he began moving normally. "He just kept saying, 'Please get me out of here, please get me out of here'," Mitchell said. After the rescue, he was taken to Lutheran Hospital in serious condition. Two other people suffered minor injuries in the crash. Delays stretched in both directions from Staten Island to Park Slope following the crash. All lanes reopened at about 9 a.m.